I tried some of the cute little quizzes at Quizilla to give my Intensive Writing class a break from practice exams today (we met for four days this week–we’re all pretty sick of each other). They enjoyed them, and posted their results on their blogs, so I thought I’d add my own result from the “Which of the Humours Are You” quiz. I think they got me absolutely right! 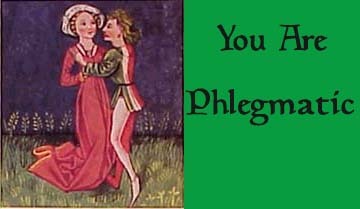 You are Phlegmatic. You have a peace-loving nature, and make a good listener and a faithful friend. You do have a tendency to be selfish and stubborn in your worst moments, and your worrying can lean towards paranoia. Phlegmatics should consider careers as accountants, diplomats, engineers, and administrators. You are a somewhat reluctant leader, but your practicality and steady nerve under pressure makes you a natural choice for leadership roles. heheh… You are Choleric. Confident, strong willed, and self-sufficient, you make a strong leader and delegator. You are the type of person that gets things done, and motivates others to do the same. Though generally optimistic, you can be driven by anger or revenge, and are at times referred to as both unemotional or cruel. Cholerics make excellent teachers, athletes, and military professionals.